The Republic of Namibia is a country in southern Africa on the Atlantic coast. It is bordered by Angola, Zambia, and Zimbabwe to the north, Botswana to the east, and South Africa to the south. It gained independence from South Africa in 1990. Before that it was called South West Africa. Its capital is Windhoek. Before World War I Namibia was a German colony. German is still widely spoken in the country, although English is the official language. Namibia has a population of 2.1 million people. The name of the country is from the Namib Desert. This is said to be the oldest desert in the world. The dry lands of Namibia were lived in since early times by Bushmen, Damara and Nama. About the 14th century AD, Bantu came to the area from central Africa. From the late 18th century onwards, Orlam clans from the Cape Colony crossed the Orange River. They moved into the area that today is southern Namibia. The nomadic Nama tribes were largely peaceful. The missionaries with the Orlams were well received by them, the right to use waterholes and grazing was given. On their way further north, the Orlams met clans of the Herero tribe. They were not as friendly. The Nama-Herero War started in 1880. They did not stop until Imperial Germany sent troops. The first Europeans to explore the region were the Portuguese navigators Diogo Cão in 1485 and Bartolomeu Dias in 1486. Like most of Sub-Saharan Africa, Namibia was not largely explored by Europeans until the 19th century. At this time traders and settlers arrived, mostly from Germany and Sweden. Namibia became a German colony in 1884. This was to stop the British. The country was called German South-West Africa. From 1904 to 1907, the Herero and the Namaqua took up arms against the Germans. In the following Herero and Namaqua genocide, 10,000 Nama (half the population) and about 65,000 Hereros (about 80% of the population) were killed. 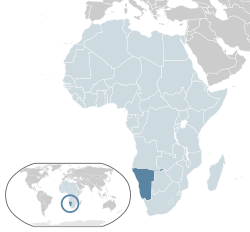 South Africa began to rule the land in 1915. They defeated the German force during World War I. It was a League of Nations mandate territory from 1919. In 1946 the League was replaced by the United Nations. South Africa would not give up their rule of the land. Many people thought the land should be independent from South Africa. In 1971 South Africa was told their hold on the country was illegal. They still did not leave. The country officially became independent on 21 March 1990. Sam Nujoma became the first President of Namibia. Tourism is a major contributor (14.5%) to Namibia's economy. It creates tens of thousands of jobs (18.2% of all employment). There are over a million tourists per year. The country is among the main tourist places in Africa. It is known for ecotourism which features Namibia's extensive wildlife. There are many lodges and reserves for tourists. Sport Hunting is also a large, and growing part of the Namibian economy. It was 14% of total tourism in the year 2000. Namibia has numerous species wanted by international sport hunters. In addition, extreme sports such as sandboarding and 4x4ing have become popular. Many cities have companies that provide tours. The most visited places include the Caprivi Strip, Fish River Canyon, Sossusvlei, the Skeleton Coast Park, Sesriem, Etosha Pan and the coastal towns of Swakopmund, Walvis Bay and Lüderitz. Namibia has required free education for 10 years between the ages of 6 and 16. Grades 1–7 are primary level, grades 8–12 secondary. Most schools in Namibia are state-run. There are a few private schools. There are four teacher training colleges, three colleges of agriculture, a police training college, a Polytechnic at university level, and a National University. The most popular sport in Namibia is football. The Namibia national football team qualified for the 2008 Africa Cup of Nations. They have yet to qualify for any World Cups. The Namibian rugby team has been in four separate World Cups. Namibia were participants in the 1999, 2003, 2007 and 2011 Rugby World Cups. Cricket is also popular. The national team played in the 2003 Cricket World Cup. Inline Hockey was first played in 1995. It has become more and more popular in the last years. The Women's Inline Hockey National Team were in the 2008 FIRS World Championships. Namibia is the home for one of the toughest footraces in the world, the Namibian ultra marathon. The most famous athlete from Namibia is certainly Frankie Fredericks, sprinter (100 and 200 m). He won four Olympic silver medals (1992, 1996). He also has medals from several World Athletics Championships. He is also known for humanitarian activities in Namibia and further. ↑ Smit, Nico (2012-04-12). "Namibia's population hits 2.1 million". The Namibian. ↑ 2.0 2.1 2.2 2.3 "Namibia". International Monetary Fund. Retrieved 17 April 2013. ↑ Dierks, Klaus. "Biographies of Namibian Personalities, A". Retrieved 24 June 2010. ↑ Dierks, Klaus. "Warmbad becomes two hundred years". Retrieved 22 June 2010. ↑ "German South West Africa". Encyclopædia Britannica. Retrieved 15 April 2008. ↑ "Namibian War of Independence 1966–1988". Armed Conflict Events Database. Retrieved 30 November 2009. ↑ "City of Windhoek Cooperations and Partnerships" (PDF). City of Windhoek. Retrieved 9 August 2011. ↑ "A Framework/Model to Benchmark Tourism GDP in South Africa". Pan African Research & Investment Services. March 2010. p. 34. 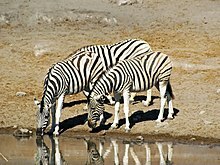 Wikimedia Commons has media related to Namibia. This page was last changed on 31 August 2018, at 15:28.